4. Cleaning supplies closetFree up room under the sink with a designated housekeeping cabinet. 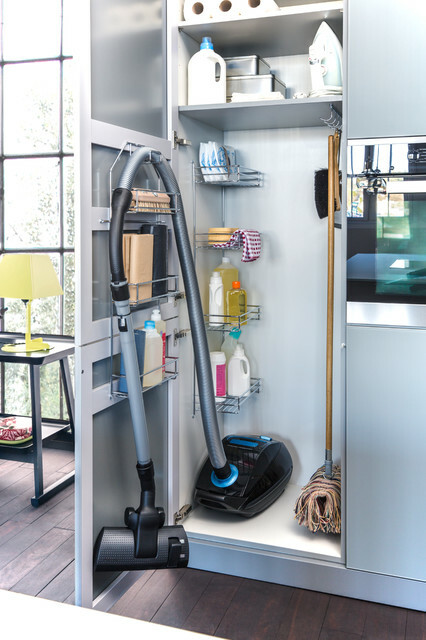 This tall space, with room for both a vacuum and a mop, is quite the attention-seeker. Home cleaning serviceIf your mum thinks like 99.9 per cent of the adult population, cleaning the house is an arduous task that is dreaded at best. If you’re not keen on the idea of helping out and cleaning yet another household outside of your own, why not sweep her off her feet by hiring a cleaning professional on a fortnightly or monthly basis. Walking into a clean house is something she’ll truly appreciate, and will give her more time to do the things she actually enjoys. Most companies provide a basic cleaning service that includes kitchen and bathroom surfaces, as well as a good scrub of the shower and toilet, mirrors, vacuuming, mopping, dusting, rubbish removal and a general tidy up. And if you have limited space for your laundry supplies, here’s your answer. Clarify who provides products and equipmentThe majority of cleaners provide their own cleaning products and equipment, as bulk buying reduces the cost to you. Ryan keeps cleaning caddies in her vehicle with eco-friendly cleaning products for the growing number of her clients who prefer them.She also uses a commercial backpack-style vacuum cleaner that’s easier on hardworking backs, and generally more efficient than domestic ones. If your cleaner uses your vacuum, keep it in good working condition and stay stocked up on dust bags if necessary. Space next to washer and dryer? 5. Hang up that broomBroom cupboards can easily get out of control, with mops and brooms falling out every time you open the door. Keep yours in order by hanging as much as you can from hooks on the wall. It’s then easy to locate the cleaning implement you need, and to pop it away securely.Hanging pockets or baskets such as those pictured here are also a great way to organise your cleaning products, keeping them up high out of the reach of pets and children. Allocate a basket for your cleaning cloths, too. Storing them in this way has the added benefit of allowing them to dry out and air between uses.